The lecture entitled "Dubai Roads & Connectors: An Initiative in Support of the Green Environment", delivered by Mr. Bilal Sidqi Saeed Jaber from RTA discussed the organization’s work in general which includes planning and implementing transportation and road projects in the emirate and preparing laws to help develop Dubai’s economy and be up to par with the world class standards. Mr. Jabr also talked about some of the public transport statistics. 16% of the Dubai population uses public transport and how the institution is seeking to increase this percentage to 20% by 2020 to lower the release of carbon dioxides emitted by private vehicles. He also deliberated on environmentally friendly electric vehicles which he predicted to rise the percentage of users to 25% in the near future. Mr. Jabr encouraged students and faculty members who attended the lecture to ask questions at the end of his talk. 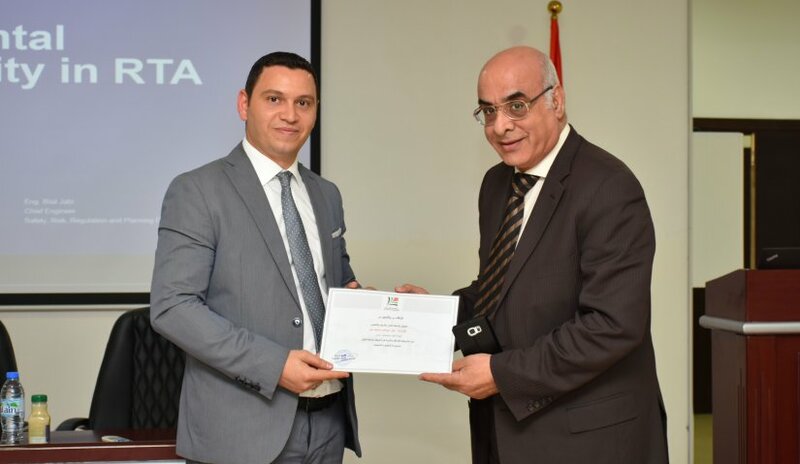 Prof. Nasr Abbas, Dean of Student Affairs handed him a certificate of appreciation for the lecture.